A 4-channel audio level controller compliant with all current broadcast loudness recommendations. Based on the Model B46, the D*AP4 LM EDITION incorporates Version 2 of Jünger’s EBU R128 compliant Level Magic™ algorithm, in addition to a suite of dynamics processors specifically designed for broadcast applications. 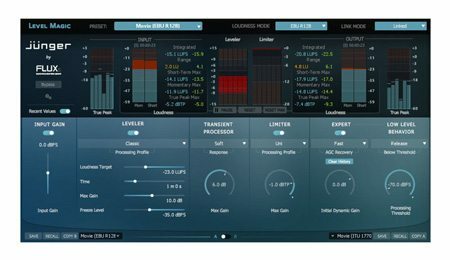 It removes all undesired loudness changes in programme level, especially when switching between sources, and does so without adding any colouration, pumping, distortion or modulation effects to the programme material. Rack-mounting (1U). 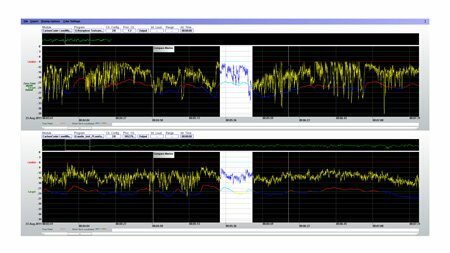 The D*AP4 LM EDITION is compatible with the Jünger Audio Loudness Logger software application. Like its predecessor, the Model B46, the Jünger Audio D*AP4 LM EDITION broadcast audio processor addresses a common problem faced by many broadcasters – significant changes of loudness occurring when switching between programme sources. Sometimes these changes can be very dramatic (especially during unattended operation). Using Version 2 of Jünger’s Level Magic™ adaptive loudness algorithm, the D*AP4 LM EDITION processes audio content to ensure that program levels remain within predetermined tolerances without any colouration, pumping, breathing, distortion or modulation artefacts, no matter which programme source is selected. Level Magic runs in the on-board DSP core, together with Compressor and Expander functions. Up to 2 seconds of delay may be inserted per-channel. A Spectral Signature feature analyses a programme for spectral content and ensures that the overall audio character remains constant regardless of source. The D*AP4 LM EDITION is fully compliant with all current loudness recommendations for broadcast audio, including EBU R128, ITU.1770-2 and ATSC A/85. Designed for ease of use, the D*AP4 LM EDITION provides an intuitive front-panel interface enabling fast and accurate configuration for stand-alone operation. It can be implemented at any workflow stage: acquisition, outside broadcast, post-production or transmission, and can be remotely controlled from a standard web browser. Hard relay bypass guarantees against loss of audio in the event of power failure; a backup PSU option with auto-changeover is also available. Standard connectivity is AES3 (XLRs) and AES3-id (BNCs). The D*AP4 LM EDITION also has an I/O expansion slot; modules to provide connectivity with 3G SD/HD SDI and analogue audio are available. Sample Rate Conversion is standard, and can accommodate all sample rates between 32 and 192 kHz. To enable compatibility with Dolby® E and Dolby® Digital bitstreams, the D*AP4 LM EDITION can be switched (locally or remotely) to operate in a bit-transparent mode. In addition to a network port, external control interfacing is possible through eight opto-coupled GPIs and eight GPO relays. Wordclock may be internal or external; the internal clock is available as a 2 V output for synchronising further equipment.